Arduino compatible Atmel AVR ATmega2560 microcontroller module with USB UART. Crumbuino-Mega corresponds to our popular Crumb2560 V1.1 module with the ATmega2560 mikrocontroller and CP2102 USB UART converter. As Crumbuino-Mega version the module comes with Arduino bootloader preloaded and mounted 16MHz crystal. In this configuration it is comparable to Arduino Mega 2560 module! Due to the preloaded Arduino Bootloader and the integrated USB UART converter with mini-USB connector, the module can directly be used with the Arduino IDE as an e.g. Arduino Mega 2560 board. Main differences to the Arduino Mega 2560 is a different pinout, no 5V regulator (the Crumbuino-Mega can be supplied through USB) and the status LED is connected to a different pin. 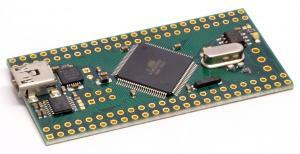 Additionally the Crumbuino-Mega provides RS232 and RS485 interfaces, which are disabled by default, so that the IO pins can be used for other purposes. Here you can download our extension to the Arduino Software: chip45-arduino-extension.zip, as well as a simple Arduino Sketch, for blinking the onboard LED: Blink_Crumbuino-Mega.zip.